Join in on the action and feel like a genuine African superhero, battling the forces of evil to save the world from imminent destruction in IMAX, D-BOX, Cine Prestige, 3D or 2D this February. Ster-Kinekor Theatres proudly brings you the much-anticipated, Marvel’s Black Panther, releasing in cinemas on 16 February. Don’t miss this Hollywood blockbuster about an African superhero is set in an imaginary technologically advanced African kingdom. The world needs more African superheroes and Chadwick Boseman, who stars as T'Challa/Black Panther, represents - sparking your imagination and entering your dreams. The immersive IMAX, D-BOX or 3D experience, breath-taking sets and incredible costumes will transport you to Wakanda. T’Challa is king of Wakanda and returns home to find his sovereignty challenged by two long-time adversaries. Their conflict reaches global proportions. The character of Black Panther was the first black superhero introduced into the mainstream comic world with his debut in an issue of Fantastic Four in July 1966. Chadwick Boseman first appeared as Black Panther in Captain America: Civil War in 2016 and Black Panther as a stand-alone film is a landmark event. Following on from the storyline in Captain America: Civil War, with King T’Challa’s return to Wakanda, he teams up, as the Black Panther, with CIA agent Everett K. Ross and members of the Dora Milaje - Wakanda's special forces - to combat his enemies and prevent a world war. In line with the month of love, T’Challa/Black Panther gains enhanced strength by ingesting a heart-shaped herb. Legendary South African actor, John Kani stars as T’Chaka, T’Challa’s father, and his son, Antandwa Kani, plays a young T’Chaka in the film in flashback scenes. Connie Chiume, best known for her role as Mamokete in Rhythm City, plays the role of Mining Tribe Elder. The film contains scenes in Wakandian, actuallyisiXhosa, taught to Chadwick Boseman by John Kani. Live out your African superhero fantasy at special Black Panther screening events, taking place on opening night, on Friday 16 February, at Eastgate (Johannesburg), the Mall of Africa (Johannesburg), Gateway (Durban) and Cape Gate (Cape Town), in both IMAX and D-BOX. Come dressed in your “traditional Wakanda gear” to join in the fun at the before and after party. Arrive at 7pm, the movie starts at 8pm, booking is essential. Bookings are now open. Members of the various Ster-Kinekor loyalty programmes will enjoy all the benefits and discounts offered by the different programmes from SK Club, Discovery Vitality, and Edgars Club when booking tickets for this film. 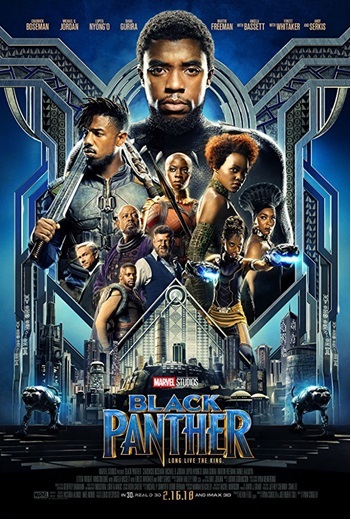 For more information, and to book your tickets for the official launch of Black Panther, download the Ster-Kinekor App or visit www.sterkinekor.co.za or sterkinekor.mobi. Follow @sterkinekor on Twitter or Ster- Ster-Kinekor Theatres on Facebook. For queries, call Ticketline on 0861 MOVIES (668 437) or book at the box office.